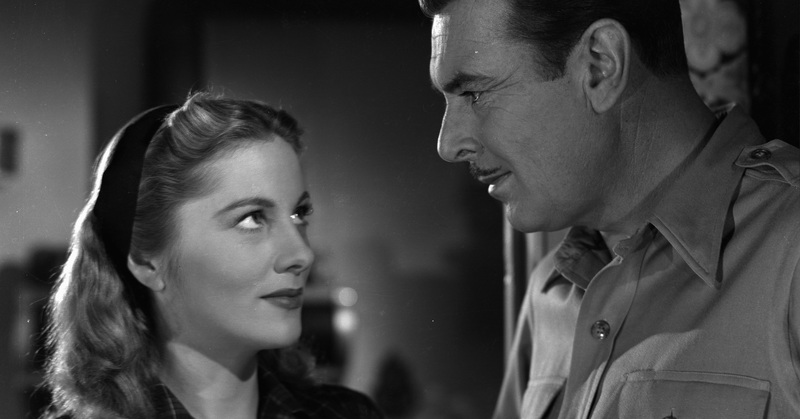 The Affairs of Susan, coming to DVD for the first time in the UK, is an entertaining Oscar nominated romantic comedy from 1946. Being 70 years old the movie is understandably dated, but still a gently funny watch. It’s a kind of rainy Sunday, curled up on the sofa with Marmite on toast film. And it is warmly funny, which for a comedy these days is unusual. Not side-splitting, sure, but cosily amusing. So who is this Susan and what affairs has she been having? Well this is the 1940s and movies were for the most part a pretty chaste business. Affairs in this sense is really nothing more than the previous relationships of the main character, rather than torrid extra marital heartache. We first meet Susan (played by Joan Fontaine) as a successful New York actress, a famous treader of the boards on Broadway. She’s just about to marry a businessman she’s only known for a few weeks. This businessman, Richard Aiken played by Walter Abel, has decided that rather succumb to fate, he will find out what has gone wrong with every single relationship (including a failed marriage) that Susan has had so that their marriage doesn’t collapse. To do so he invites all of Susan’s previous partners to the party to ask their advice. Each of these former partners describes, chronologically through flashback, a seemingly different person. The first (a Broadway producer) having encountered her as a naive farm girl while he was out of town working on a script. It was his persuasion that she’d be perfect on the stage that led her to New York in the first place, and into that first failure of a marriage. The second describes a party girl, out on the town carousing. And the third a serious bookish owl. None the same. But each of the men is still hopelessly in love with and protective of her. What becomes clear is that Susan has not, for a single moment, been allowed to be herself. She exists in a reflective state – simply reflecting back on her partner what they wish to see. She has been trapped by expectation, the demanding producer, the man who just wants fun, the mainsplaining idiot of an intellectual novelist. Attitudes to gender roles have changed somewhat since 1946. It is refreshing to see a working woman at the centre of a film despite the fact the film seems hell bent on settling her down with people who might not be right for her. What’s most unusual from a period piece like this is that Susan is the main central figure who everyone revolves. She ultimately holds the power, it’s the men who want to marry her. The slightly troubling theory behind the story is that it has taken all these relationships to make her into a more rounded person. Standing back from this distance in time we can see that this is, of course, nonsense. She has simply had more of a chance to see the world. Instead what we are left with is a stronger character whose eyes have been opened to the idiocy of those around her. And their love, and her genuine feelings of warmth towards them. As a modern audience we feel happiest when Susan is doing what she wants, and not pandering to the wishes of her hapless admirers. We kind of get the impression that in 1946 this might have been a bit racy, and to a certain degree it remains surprising for what we know of attitudes of the time. That said it doesn’t play as controversial. It’s a zippy film, played for laughs, and the performances are charming throughout. Which of the four suitors, if any, does she end up with? Well, it’d be a spoiler to tell. But it is also a romantic comedy, so it’s worth betting on one of them. Where a modern update might have her remain alone or find someone entirely new, it’s with a certain structural inevitability that Susan’s “affairs” come to an end. The Affairs of Susan comes out on DVD on the 21st March, for the first time ever in the UK. If you have a rainy Sunday afternoon to spare, it’ll do just fine.